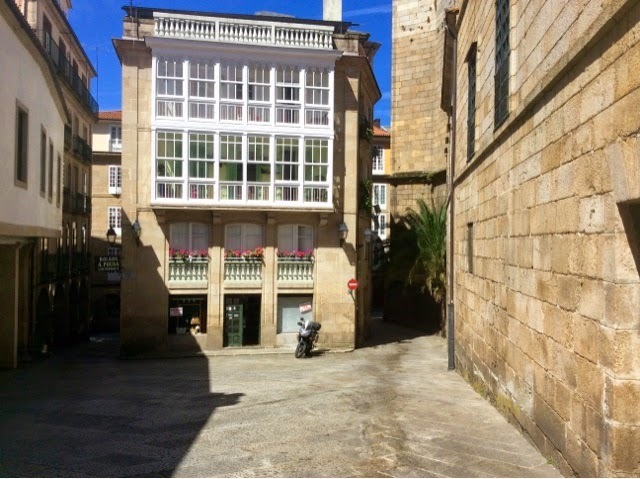 A Laxe to Santago de Compostela. The end of the journey. 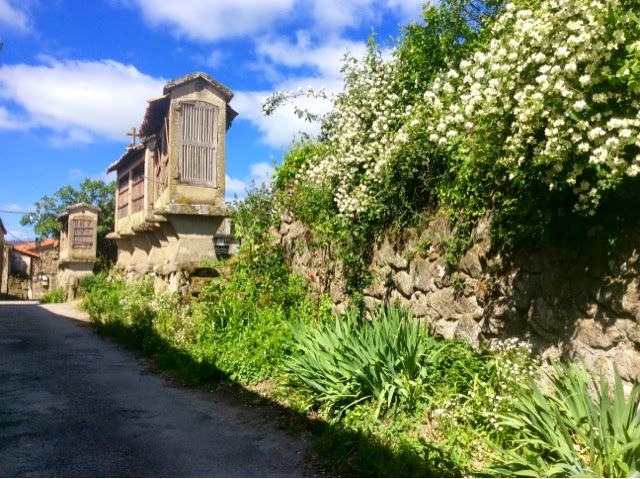 We all have our different reasons for walking a Camino. This is my third and my reason has always been the same, to raise money for my local hospice. I know from the statistics that my blog has had several thousand page hits and is being read in over 20 countries. The sole aim of my local hospice is to ensure that no one dies alone, in pain or without dignity. I hope you have enjoyed my blog. 1. The donations are handled by an international organisation who insure the money goes direct to the charity. Your donation comes nowhere near me. 3. Why not consider making a donation for a loved one. You can leave a dedication on the website. 4 if you prefer your personal information not to show up on the website you can do this also. 5 I do fully understand that we all have our local charities to support in every corner of the World and I wish you well with yours. Thank you for allowing me to mention this,,now back to the Camino. 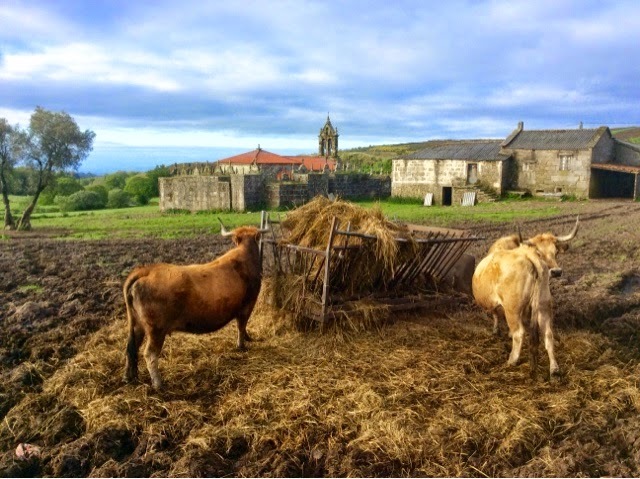 The hill out of Oseira was steep but I was soon deep in the heart of the Galician countryside and walking its narrow drover's paths that were awash with run off from the fields, meaning that I often had to hop over a wall and beat a path through a field. Occasional shrubs had starting growing across the path which suggested not too many people came this way. 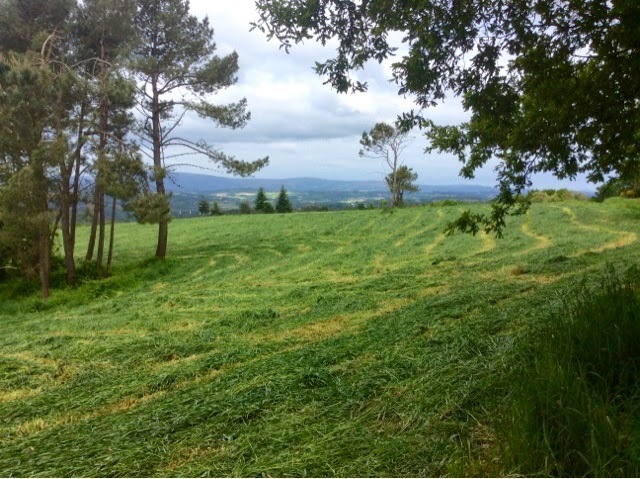 I pressed on through farms where the smell of rotting silage pervaded the air. It was the first time that I had passed through so many working farms grouped so closely together. In places cords of wood were being collected, not for this years fires, but for next year. The wood for this year would be gently seasoning over the coming months having been stored from last year. 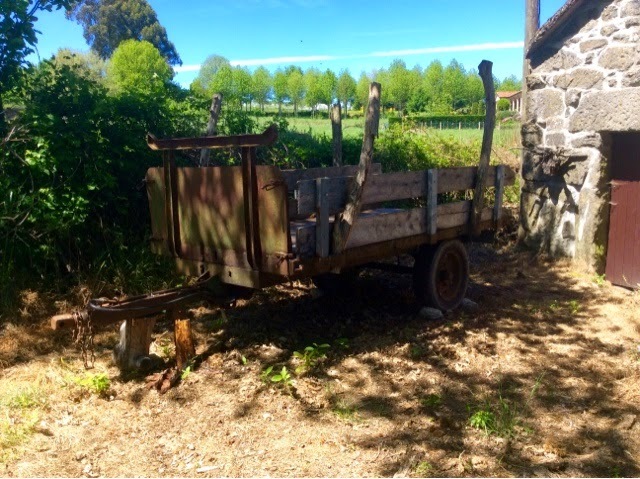 Next years silage was also being cut and left to dry, some were readying their ancient equipment for the summer toil, while other premises were displaying thier support for the Camino. 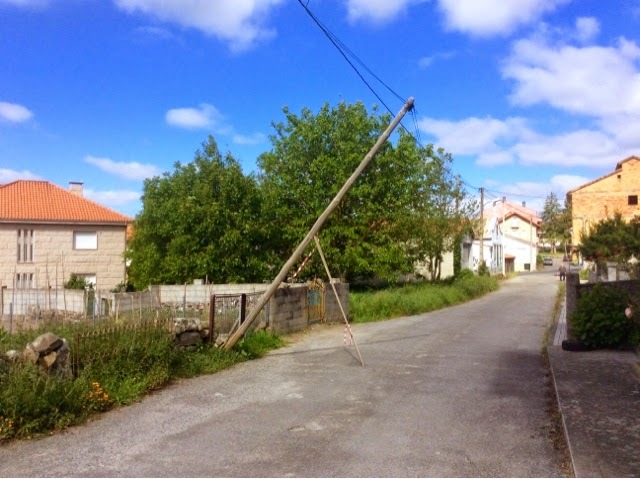 In one village I lost the arrows. The signing around here is not too good. It meant a loss of some forty minutes but when I did find the track I had two agresseive dogs to contend with. One came from behind and one in front. Both large, both snarling and both baring their teeth. I dealt with both by making out to throw stones at them.They left the scene. I was criss crossing a major road that was separated from the track by a wire fence. Along the line of the fence passing pilgrims had place makeshift crosses simply by threading two bits of wood through the wire. I think it was a sign for them that they were reaching the end of their journey. 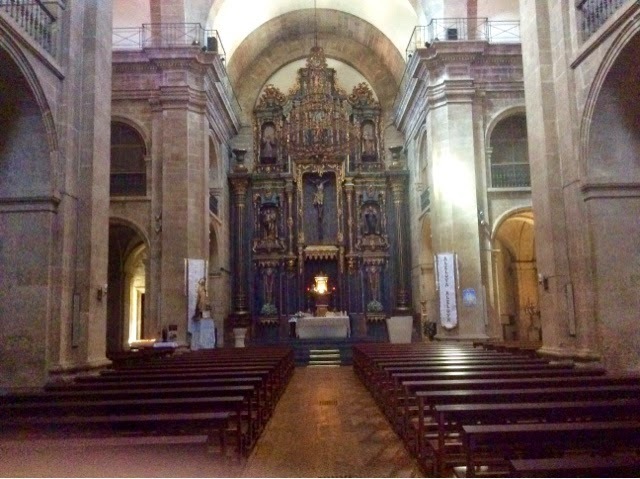 Thirty eight days and 1000kms after leaving Seville I stood at the altar of St James in the Cathedral at Santiago de Compostela. I moved to a side chapel, lit the candles and said the words I had been requested to. Each morning I had fired up my engine by reciting the words of that great poet, Robert Frost. 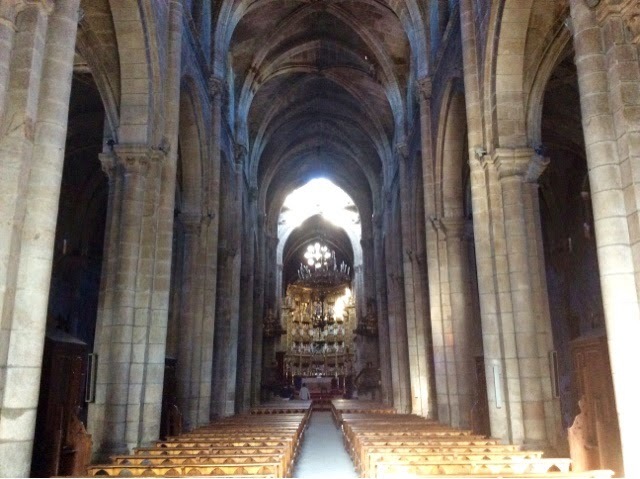 Now, my task was done I convoluted his words somewhat as I left the cathedral. I'd no more promises to keep, no miles to go before I sleep. And that will be sufficient for me. Thank you for following me on my trek, and may your God go with you. 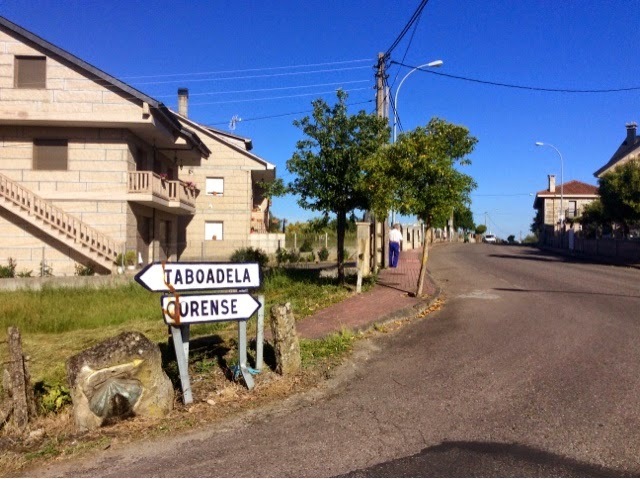 Cotelas to A Laxe - 49,5kms to go. 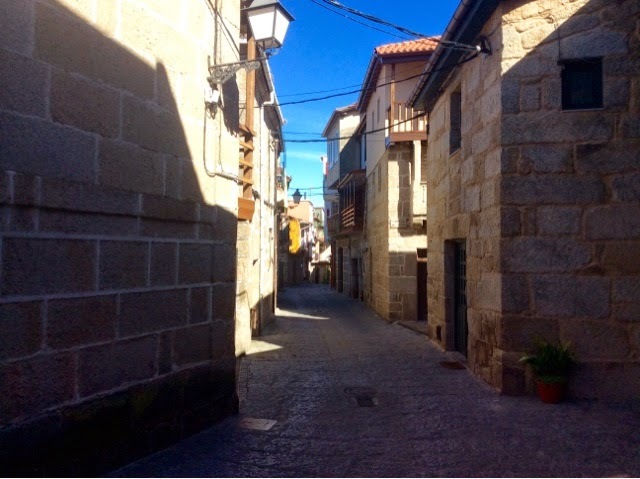 The little village that I am in Cotelas, is typical of the many that I have passed through. 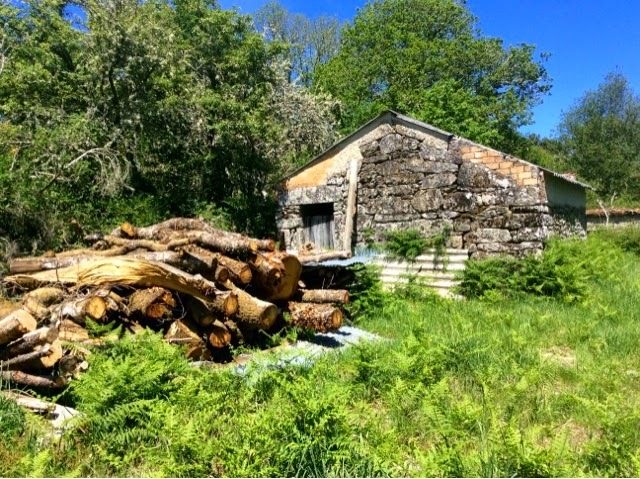 There are a smattering of modern houses and a double smattering of granite built family homes and their associated barns that have, or are about to fall down. It's hot here now, well over 35C and I'm going to explore. 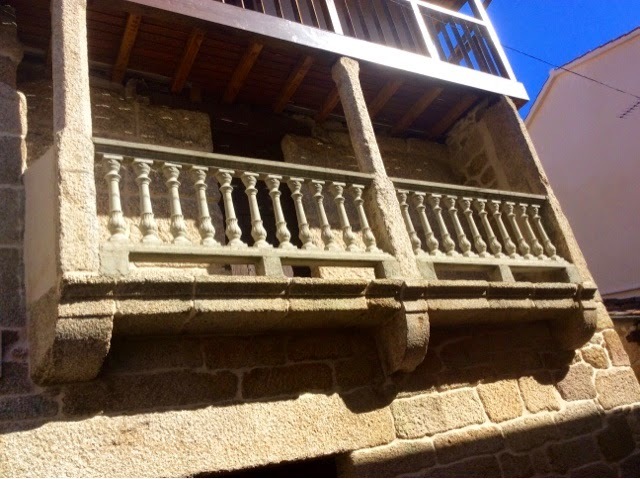 Opposite the bar is a granite house that has not fallen down. Lived in and well loved. 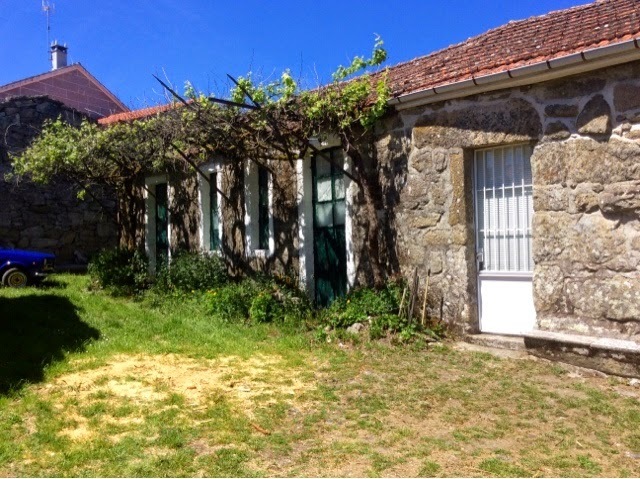 But behind that is an old barn that has had an extension done on the traditional way. Several courses of red bricks built up and the old bendy beams and tiles put back on top. It now has an upper and lower byer. I climb the wonky granite steps and peer into the gloom. There is a blue tub with fresh hay in it. Shafts of light pierce the dark and there is a smell that suggests something was here not too long ago. 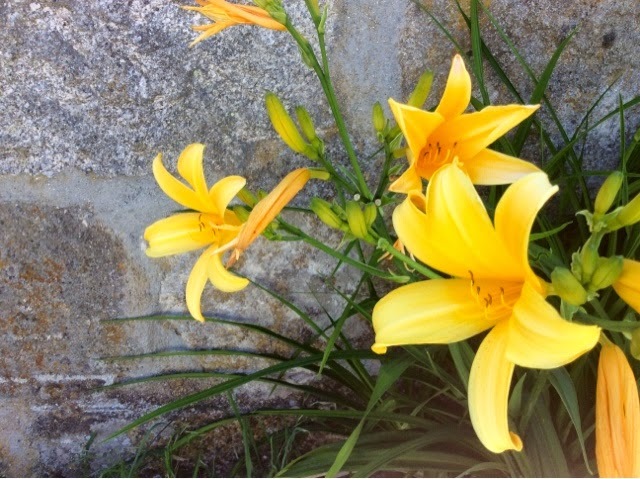 Descending and growing wild is a beautiful strand of yellow flowers. Up the lane is the communal clothes washing area, now fetid and covered in green weed. Water still drips into it sourced from some underground stream, and if there were more visitors to this area it would be a focal point for the village. But there are washing lines strung across it so perhaps this is where the latest scandals are desemineted. Poking my nose around a corner I come across another house with its doors and windows shuttered. I wonder when they will be back. I make my way further away from the village along a grassy lane that simply begs to be walked along, and come to a small holding. Now long removed from its original life the buildings are still used to hold something as the doors are locked and I can't pierce the gloom to see what's inside. Old bits of furniture lie around. There are a couple of armchairs that look as if they would fetch money in the posher circles of London. And if you are looking for a use for that old spring bed bottom. Use it as gate. Now that's proper recycling. 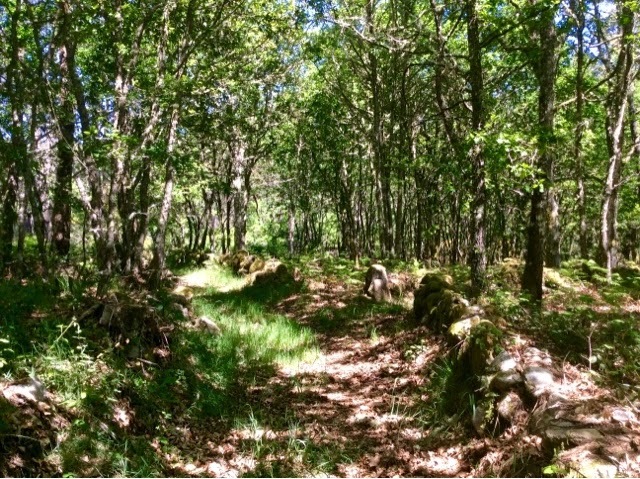 Another path leads away into some woods. They are descending and I put money on what I'm going to find at the bottom. The long grass suggest I am the first to walk this path for some time. The tightly knit spindly trees allow a trickle of light through, but that's all. Just enough to heat up the leaf litter. 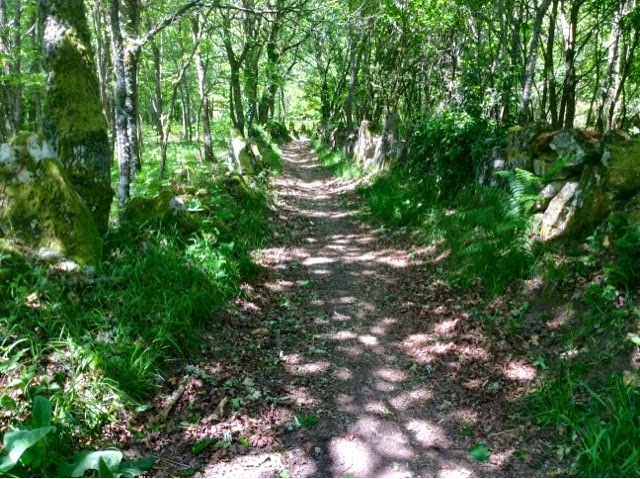 The path is about a metre wide and either side is a granite wall that must have taken some effort to construct. Yet it was never tall enough to keep livestock in its place and I suspect these were boundary markers. This is my property so keep out. I follow the path down. It exits into a long a abandoned field where the grass is thick, tall and tough. The heat from the sun is ferocious for someone who has been in the cold for many days. In the distance I can hear what I'm looking for and pushing aside muscular brambles, that would win the contest between us in a few weeks time, I come to the river. A large granite slab lays diagonally across the river causing a waterfall to form either side of it. 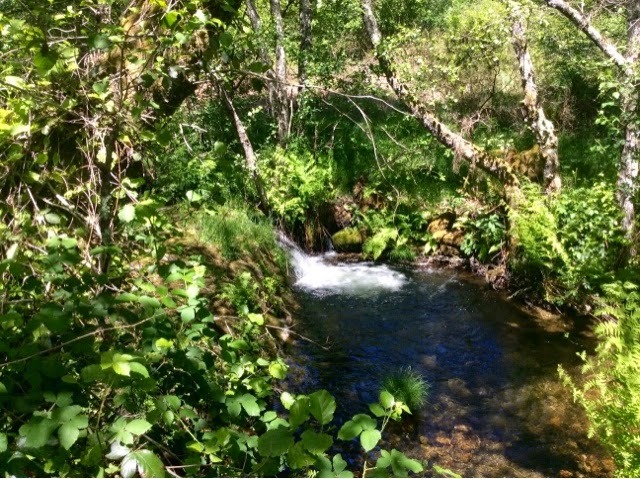 I sit for an hour and watch the courting of two turquoise Dragon Flies. Another, a brown one tries to get in on the act and is chased off. Yellow butterflies impervious to what is going on flit over the water. And all the time the birds sing. After an hour I make my way back but the brambles, angry that I have defeated them, have one more trick for me. One lies waiting in the undergrowth. I catch my foot in it and my head goes slamming into the ground. I can feel the blood trickling down my forehead. Not satisfied with grounding me it lay a path of thorns for me to fall on. I make my way back to the bar and madam, on seeing my somewhat bloody appearence gets out the first aid box and sets about cleaning me up. She asks me if the antiseptic hurts. I feign a cry, we both laugh and she brings me a beer, while I try to straighten my glasses and look forward to my octopus salad for dinner. The dinner was excellent, a large quantity of octopus and salad followed by some cold cuts and a delicious ice cream. The cold cuts that I did not eat were made into a sandwich for me to take for the following day's trek. Being a Sunday the bar closed early, at 8pm, and the owners decamped for their home. I sat outside the bar to watch a dark veil gradually wended its way up the forest as the sun dipped away for the night. There was no one else around save for the birds that had now come out to feed. Pied wagtails jumped and flutterd their wings in search for insects, a bullfinch tried to feed and defend its territory, and a skittish wren busied itself searching for insects in the spaces between the stone walls. I switched on my iPad and listened to the resounding tones of a male voice choir. 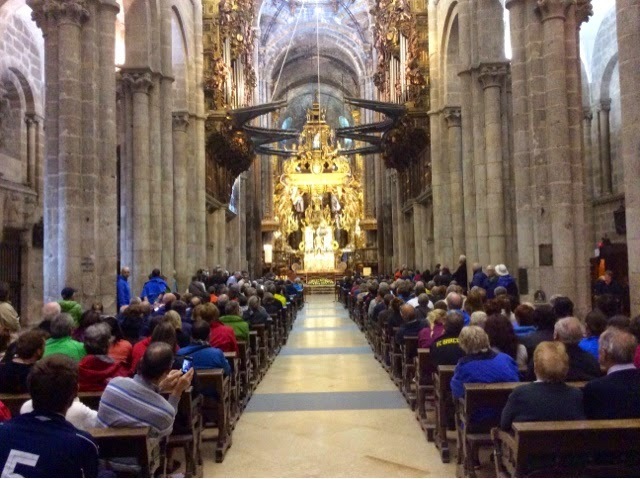 It was just another Sunday on the Camino. I passed this church on the way. 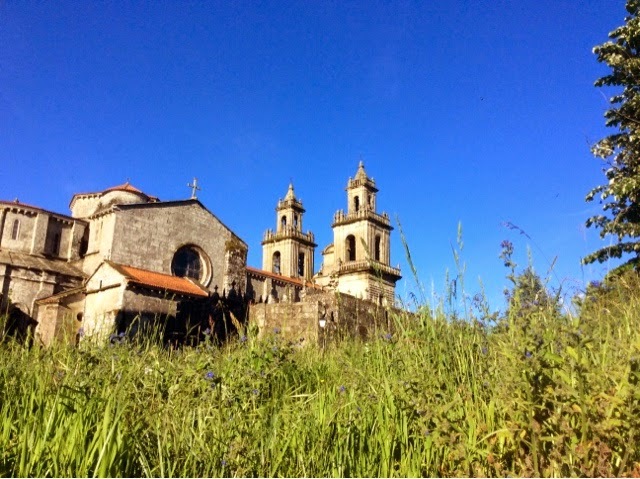 It was only a seven kilometre walk along the road to the Cistercian monestery of Oseira. On approach I could hear the sonorous clanging of the bell. It was 9am. The cuts on my head were stinging from the salt that fell into them from the sweat on my scalp, and my shoulder was aching from yesterday's fall. I thought it would be a good idea to spend the day and night here. I made my way to the shop. I was a little early but a brother open the door and with a beaming smile, welcomed me in. He was a short, stout man with a kind but very, pale face. He peered out from steel rimmed glasses and his brown and white habit swayed as he walked. He was called Phillip Maria Loius. I asked if I could stay for the night. Of course I could. He looked at my forehead and asked what had happened, and showed concern when I told him. We discussed why I was doing the pilgrimage and then we shook hands. 'Bless you, Brother,' I said, and added, 'Actually, I think that should be the other way round.' We laughed, 'Bless you,' he said. 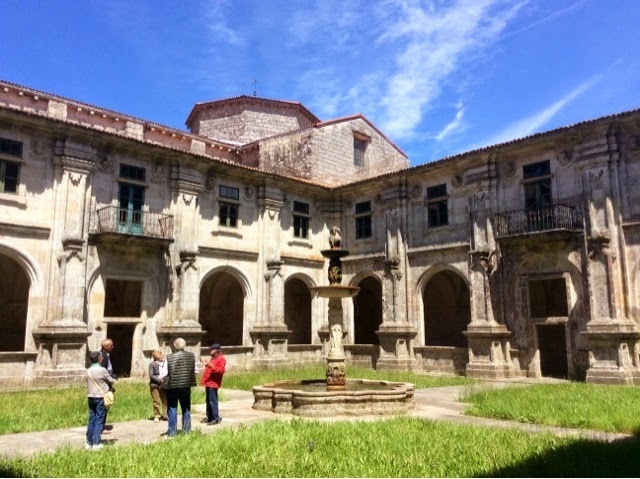 I left and made my way to the aubergue that sat to the left of the main building. 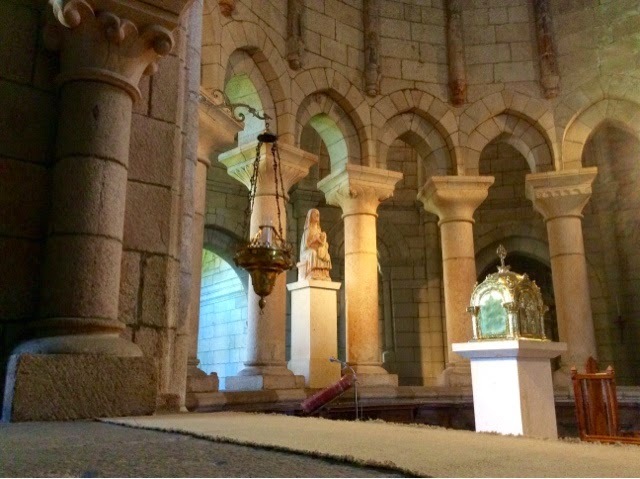 The aubergue is situated in a huge rectangular granite building that has a massive granite barrel shaped ceiling and a blind arch on the far wall which I assume was where the altar was when this was a church. 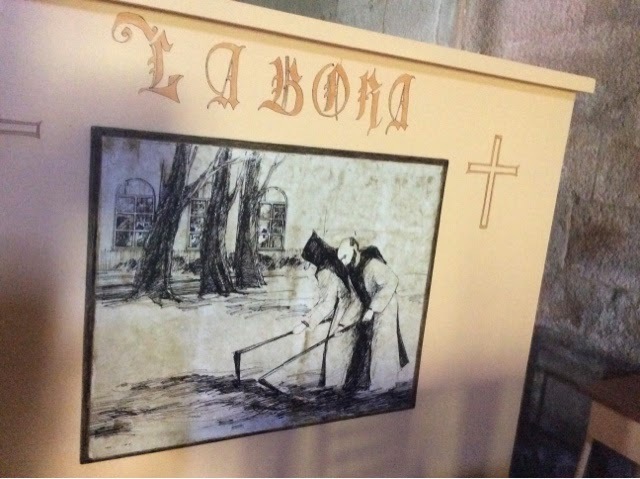 There was no one in the alburgue which was dark, damp and somewhat forbidding. Panels displaying religious iconography stared back at me. I looked behind them and discovered several bunks. I choose one, showered and made my way back to the shop to get the stamp for my pilgrim passport and pay my donation which also entitled my to a free tour, which I decided to take later in the day. I work on the principle that if you re not supposed to go somewhere someone will always pop up to tell you, and as i went through the door to the cloisters a young man appeared and told me it was not allowed. I told him I was looking for somewhere that was quiiet, and where I could relax for a few hours. 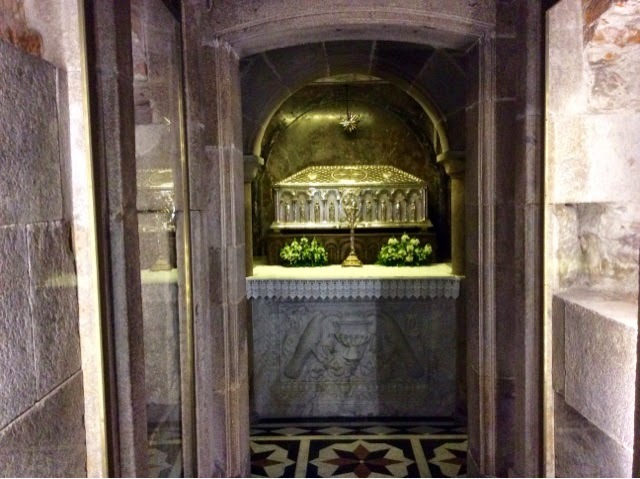 He thought for a Second and told me it was allowed this once only and that I must not leave the cloisters. Fair exchange, I thought. For the next couple,of hours I sat on the fountain, for there are no seats, and enjoyed the warm sun on my back. First let me start by saying that if this building was a vineyard it would be suffering from a case of Noble Rot. A fungus on grapes that effects the wine. Once, 150 monks worked and prayed here but the regime of five hours work five hours sleep and then prayer proved too much for many and today only 12 monks are in residence. You can become one but you just can't turn up and knock on the door, well, you can, but you will have to serve a two year induction course which essentially means following the strict rules as laid down by St Benidict. Only one in a hundred survives. But no one applies today. 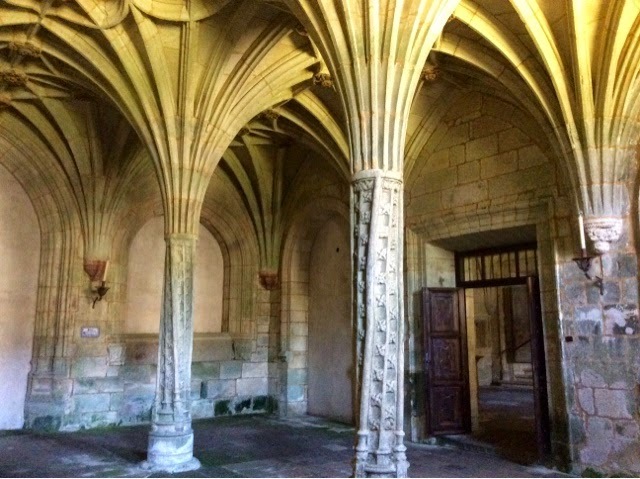 During my tour, which I took twice as you always see more the second time around, I discovered that there are four cloisters, and rooms that face the sun that were given over to writing the scriptures. 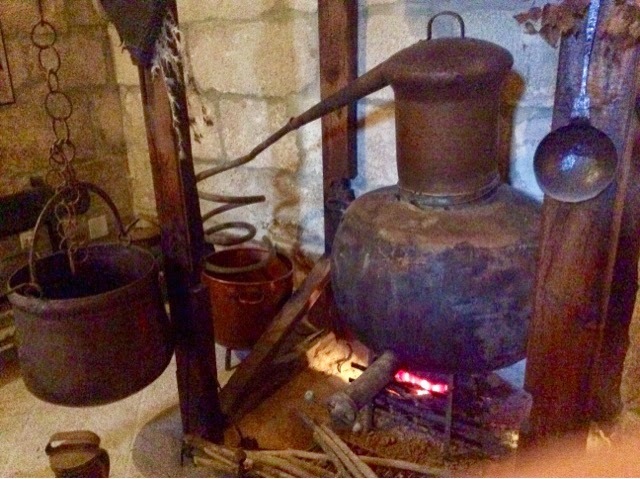 Other rooms were used for one of the major industries of the monestery, the production of medicines from herbs grown in the gardens. In the church is one of the oldest known sculptures of the Virgin breast feeding her child. 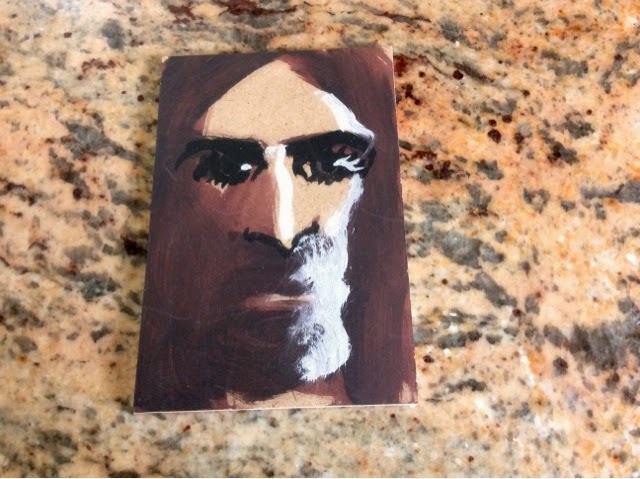 A rare piece of iconography. 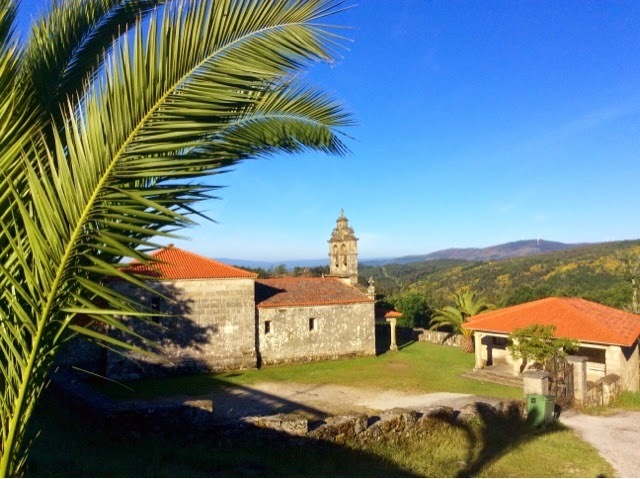 There is a sacristy where the 15C pillars are in the shapes of palm trees, irregularly sculpted to give movement to the granite, of which virtually everything here has been chiseled, carved or hewn from. There are flowers on the pillars and each one is different. 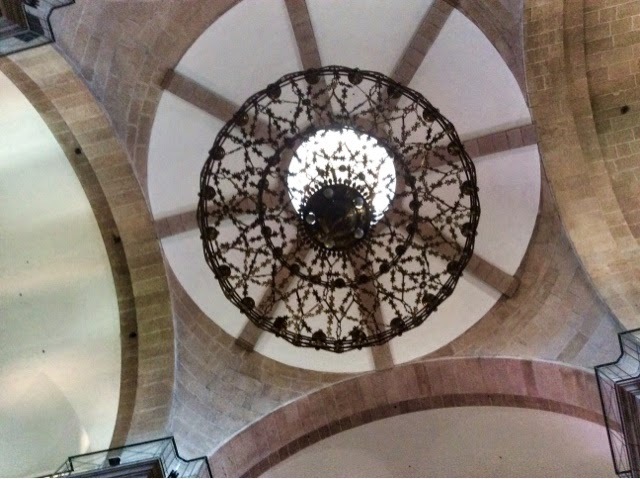 They represent letters, they are a code from which messages from the scriptures can be found. 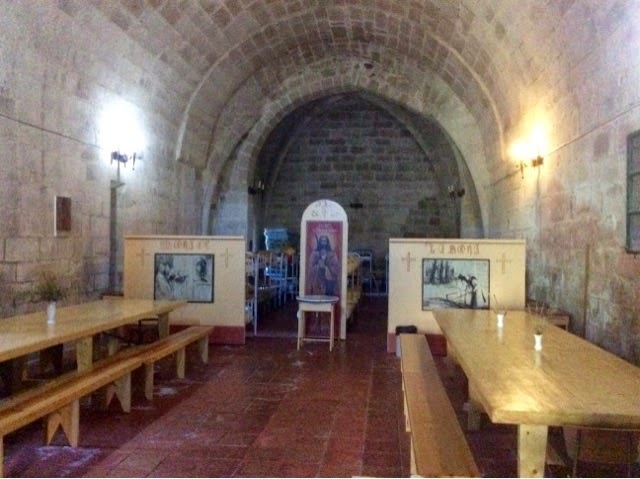 Many pilgrims come in this direction, see the monastery from the outside and move on. 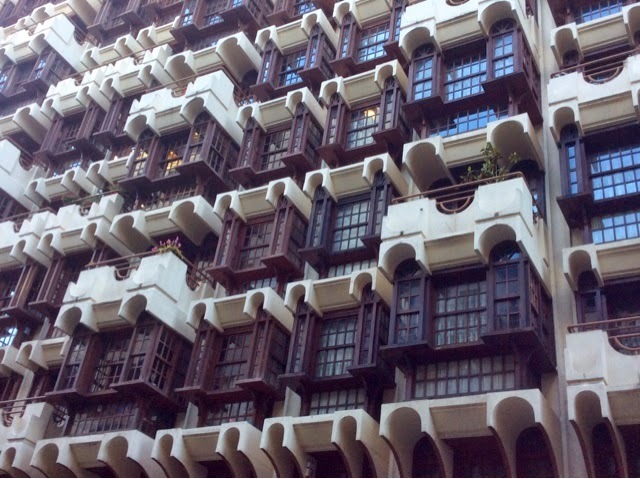 But it is worth spending a little time to take the hourly tour that will get you behind the facades and into the heart and history of this magnificent group of buildings. I spent the rest of my day relaxing in the warm sun, and in the evening I attended Vespers, a priveledge granted to pilgrims, of which there were only three of us. At 7.30pm prompt we met in the shop. 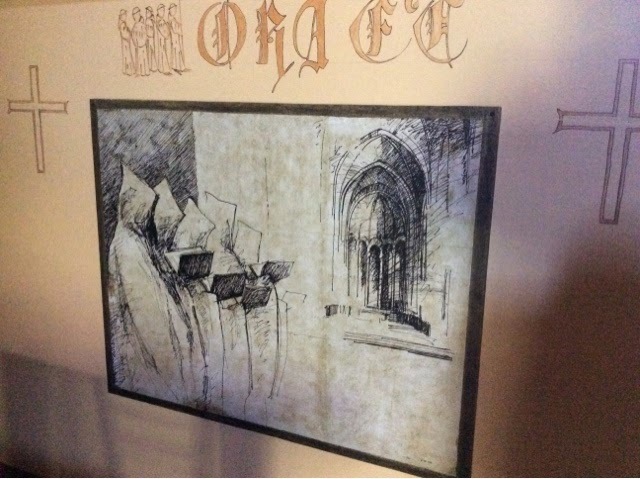 Brother Phillip gave us each a painting he had done on board. No bigger than the palm of my hand it was beautiful . We were taken up stairs and along corridors that previously we could only view on the tour, peering into the monk's cells as we went. Eventually we arrived at a very small chapel. 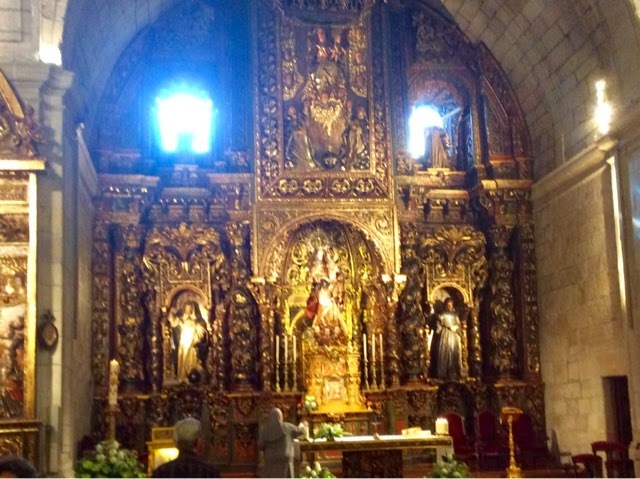 In the centre was a granite altar and on the wal behind a lIfe like statue of Christ on the cross. 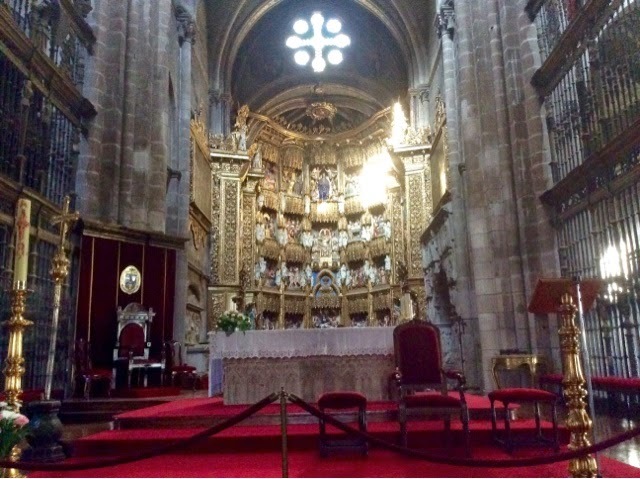 We sat at the back and, at the ringing of more bells, the monks, dressed in white hooded long habits, entered the room and filled the benches either side of the chapel. An organ played a note and the monks started to sing. Sometimes together, sometimes In responses to others, and occasionally solo. I could see that some were elderly and were granted the dispensation to sit while others stood. Many yawned. One had a sneezing fit, and a young man who was still in his probationary period wrapped his habit around him with a theatrical aweep whenever he sat down. These men were immensely devout and yet very human. I felt I had been granted a glimpse into a very private world. I would not forget it. By 8.45pm I was in my own bed. I pinched another pillow and blanket from an empty bed, kept my fleece and socks on, and fell asleep, waking 10 hours later. The following morning I made my way up the hill and out of the village. 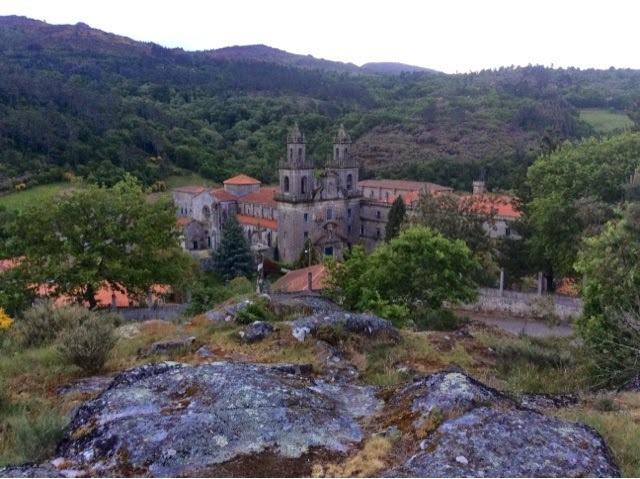 At a vantage point I stood on a granite rock and looked back down on the monastery. I doubt in 60 years time there would be any monks there. I turned my back and walked up the hill. 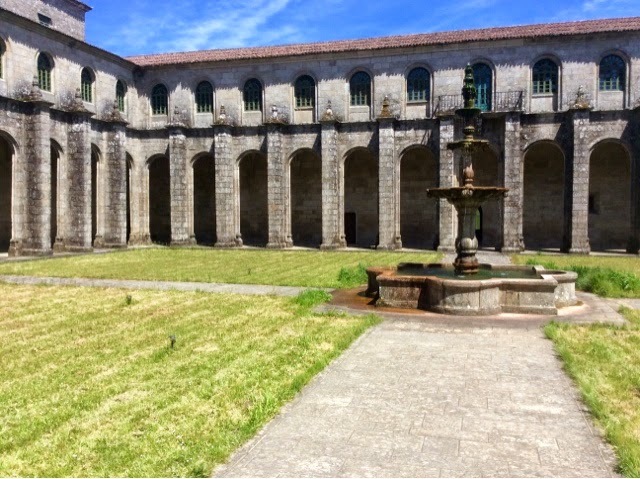 I would never see the monastery of Oseira again, but I would never forget it. 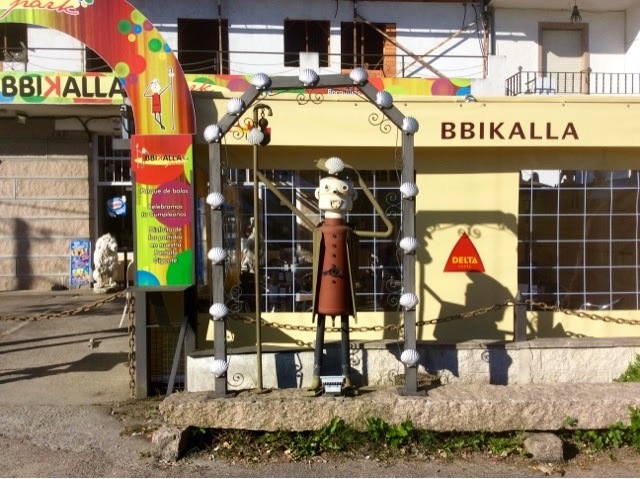 Laza to Cea - 89kms to go. 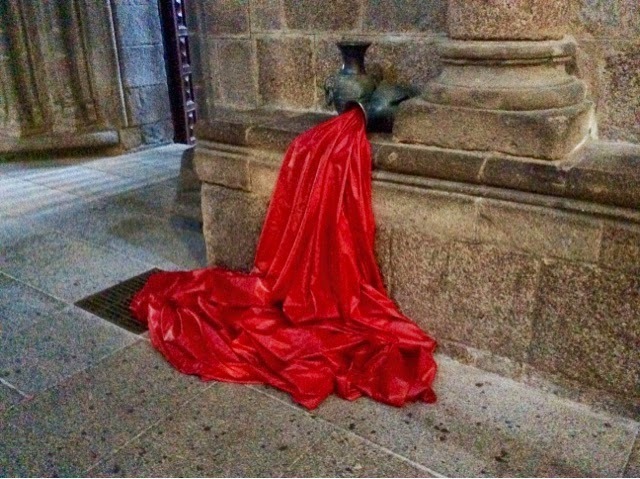 For every delight the Camino throws at you there is always a price demanded in payment. After the beauty of yesterday the pain was extorted in the form of physical punishment. At least for me. 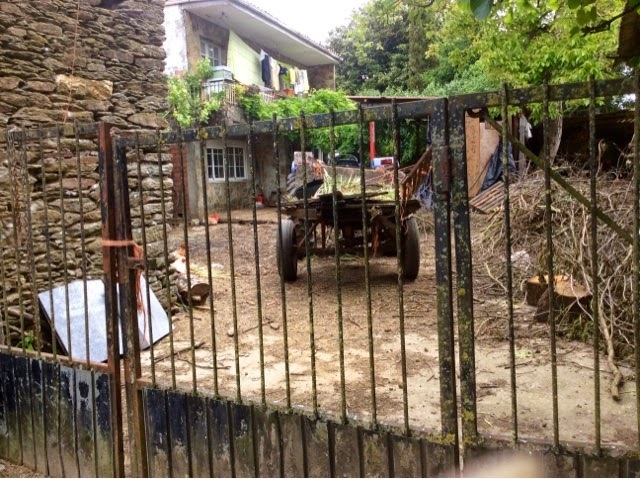 It started three kilometres from Laza, at the village of Tamicilas. Six kilometres of vertical climb on an asphalt road in the teeth of a ferociously cold wind. I could never in my life imagined that I could sweat so much yet be so cold at the same time. The wind cut through my three layers of clothing and I felt as if I was being dissected by ice knives. There was no point in looking up. The meanders simply got steeper and when I thought that was it another appeared. It was a case of bend into the teeth of the wind and get on with it. I did, though, have two advantages. I was considerably lighter than when I started in Seville, and my thigh and leg muscles were immesurably stronger. It took me well over ninety ninety minutes to walk what would normally take considerably less that. 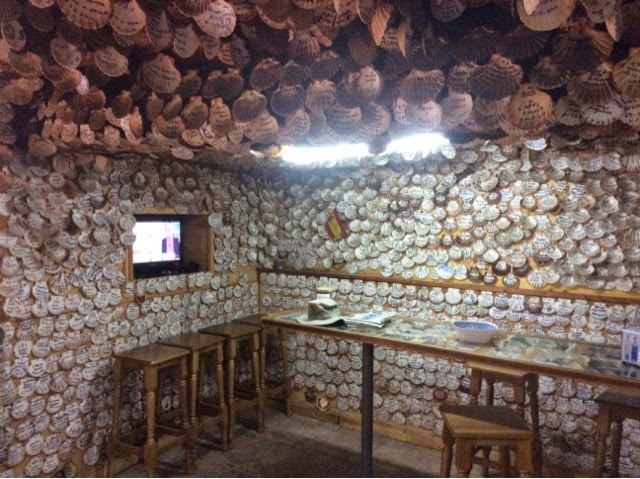 A bar has never been more welcome and the one in Albergueria doubly so, for every available space on the walls and ceiling were covered in scallop shells with the names of the,pilgrims who had put them there. Decades of them. Now there is one more. Not only that. Never has a coffe and boiled egg tasted so good. 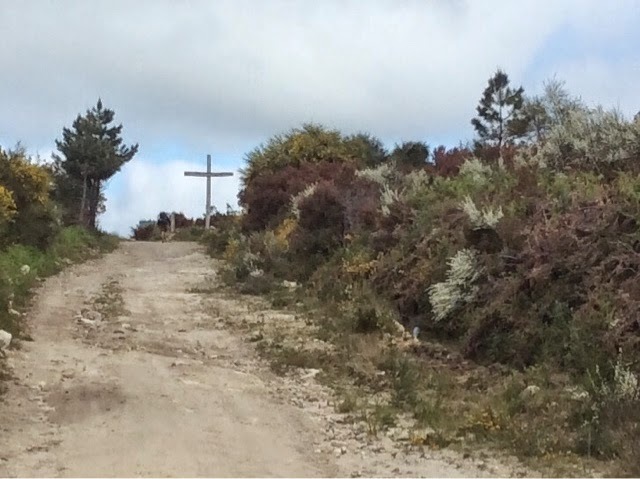 Shortly on leaving the village I surmounted the summit at Monte,Talarino with its wooden cross before starting the long descent into Villar de Barrio. 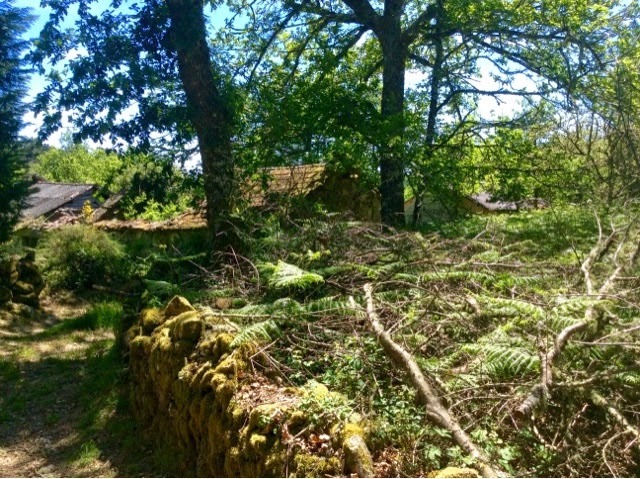 It was to be a day of tiny villages, long paths and secret narrow drovers paths though woods that had appeared to have been planted, and then forgotten. In Villar a very old man stopped me. He said nothing but put his walking stick under his arm, grabbed my hand and shook it. Looking me directly in the eye as he did so. The he walked on. I was almost reduced to tears. It was here that I came across the first of the small grain silos, constructed on stands to allow the wind to blow through and to keep,the rats away. There are many designs, but they serve the same purpose. The villages rattled by. Boveda, two fountains and a shop. 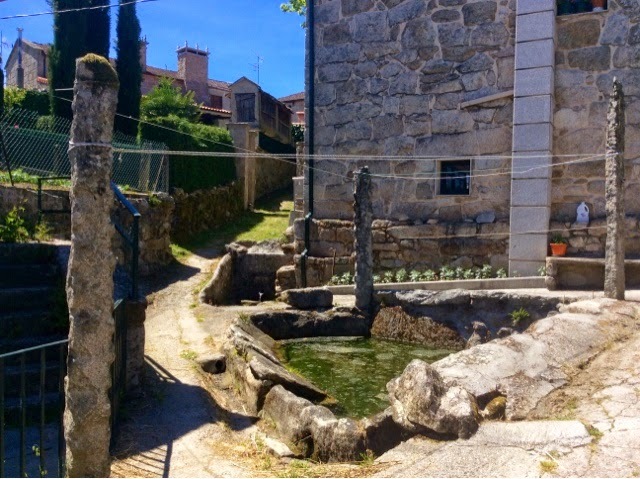 Bobadela, one fountain, Padroso, no shop, or fountain. But each had something simple and special about them, an other world feel, bypassed by events, concerned only with what happens within the confines of the village to be discussed later, and loudly at rhe bar. The track then changed, woodland paths wide enough for a file of sheep and nothing else. But someone, ions ago had lugged the heavy stone to build the walls with a plan in mind for their future. 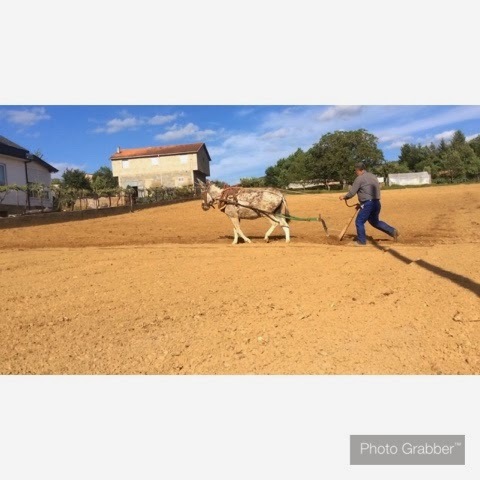 Along the way farmers did what they always did, got on with the toil of the day. And if all else fails. The path gave way to an escarpment. It was as if someone had pulled back the theatre curtains and the show was about to start. A beautiful and long reaching view erupted in front of me. 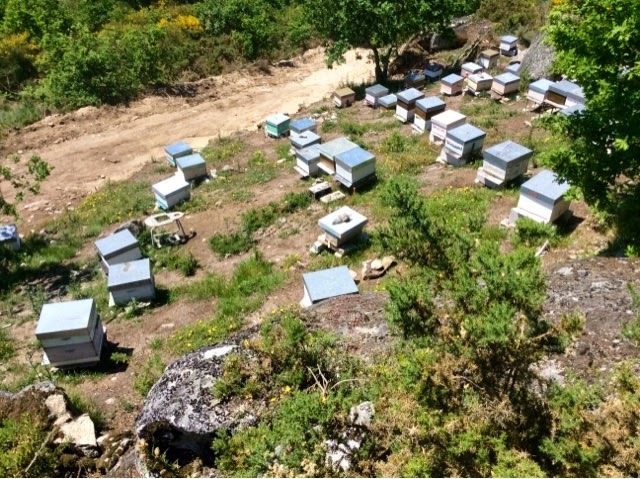 Bee hives had been been strategically placed to catch the sun and the aroma of the myriad heathers, gorse and flowers that begged to be visited by them. I bet fhat honey was something special. It was warm on the hill, but the wind was cold still out of the sun. 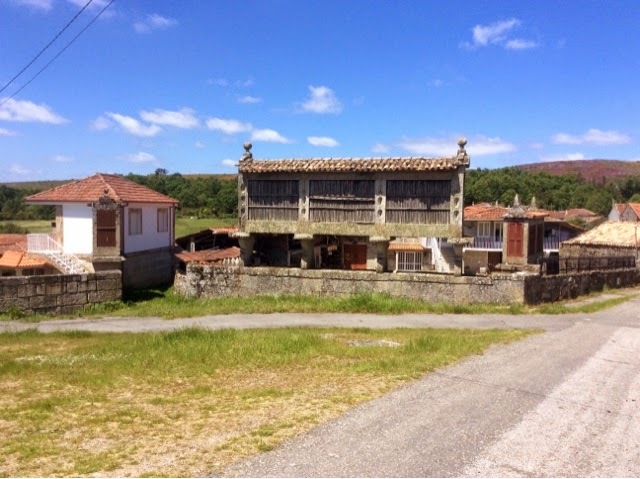 As I entered the town of Xunqueira de Ambia, ( don't ask me to say it, I'll strangle myself), I mused what a strange day it had been. 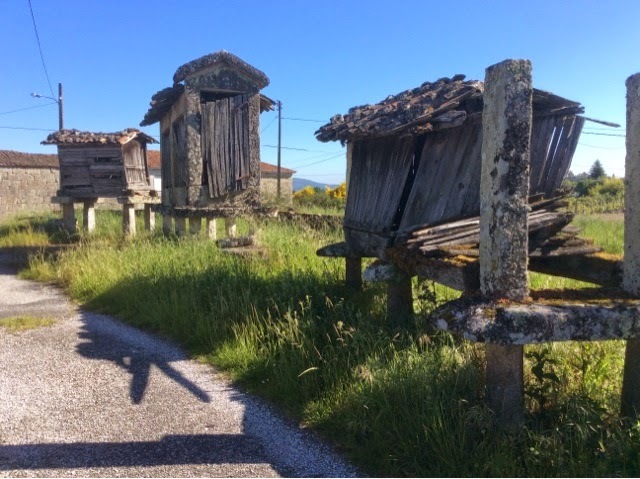 The camino had presented me with a challenge and then, as if in reward for meeting that challenge, had delivered a colourful patchwork of what Galicia has to offer. It had been another very satisfactory 34kms. 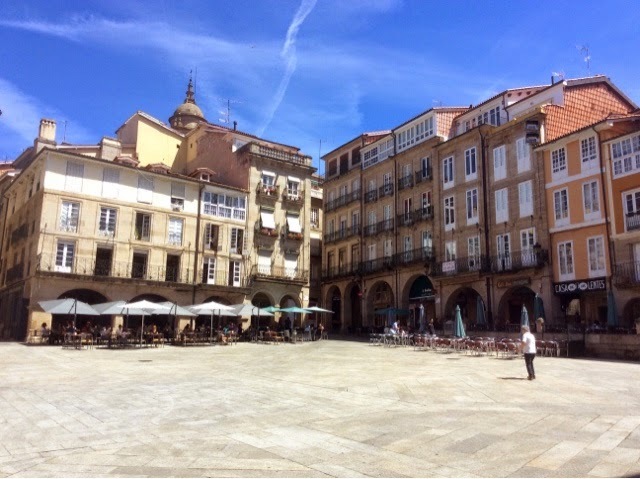 On today to the last great town before Santiago, Ourense. This was simply a get your head down and get moving sort of day. Asphalt road the occasiona dirt track, and villages that would win no beauty competitions. I received the occasional raise of the hat from the elderly men I passed and I responded by tipping my hat. 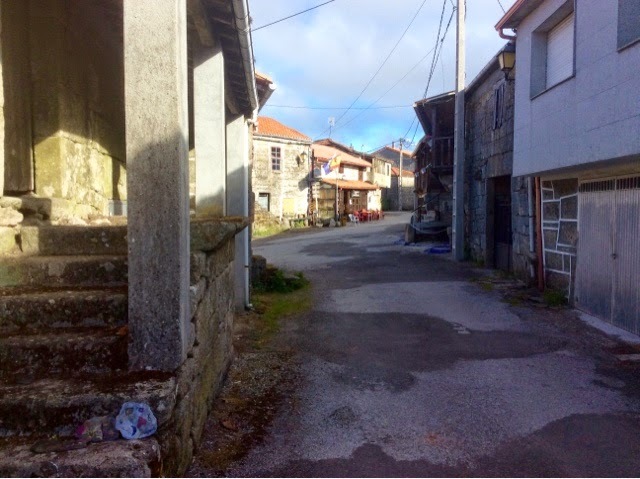 A few kilometres from Ourense I walked through an industrial estate, quite a shock after weeks spent walking along along an isolated and often beautiful trail. 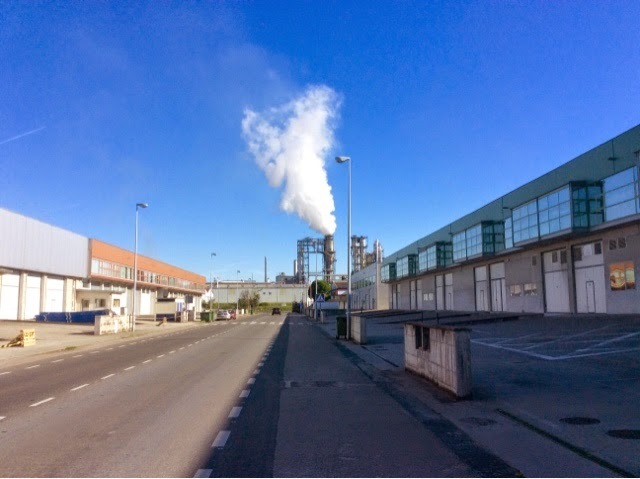 Heavy lorries, rusty railway trucks in dirty sidings, broken pavements, and the roar of steam rising from a chimney stuck on a factory that, from the smell, was making fibre board. The other problem centered around the way markers. 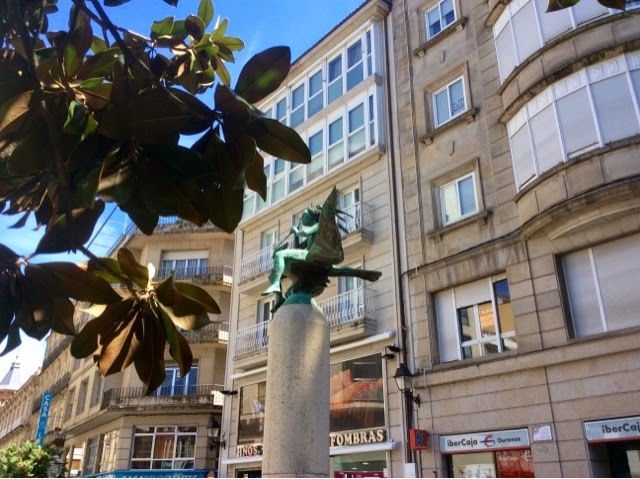 Ourense took the brave decision to commission a local artists to make original sculptures denoting the meaning of the way. I think they are excellent and evocative of what the route is about. However, they are now dirty and the paint has worn making them difficult to see and hence easy to miss. They need a jolly good clean and repainting to restore them to their former glory. They would, when renovated be excellent works of art. Talking of works of art, the owner of this bar has done his bit. 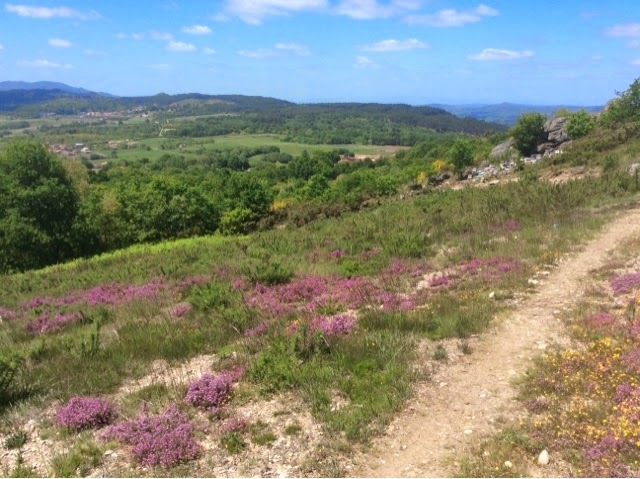 As if to tell me to stop moaning the Camino sprang a real surprise on me. 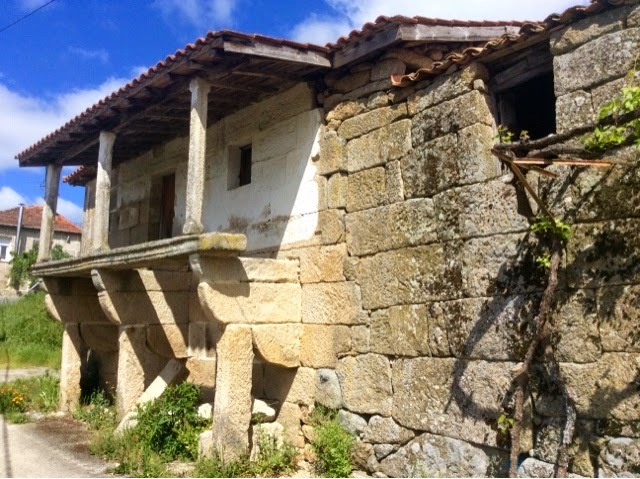 The village of Seixalvos, around some three kilometres from Ourense, is a delightful jumble of granite houses, big balconies and winding streets. But it had one big surprise for me. While passing the local bar a group of people immerged wearing green scarves around their necks. I was stopped in my tracks as my hand was pumped vigorously. It would appear I had come across the local branch of the Friends of the Camino. More hands were shaken, lots of photos were taken and one of the group asked me questions about my trek in English which he translated to the group. 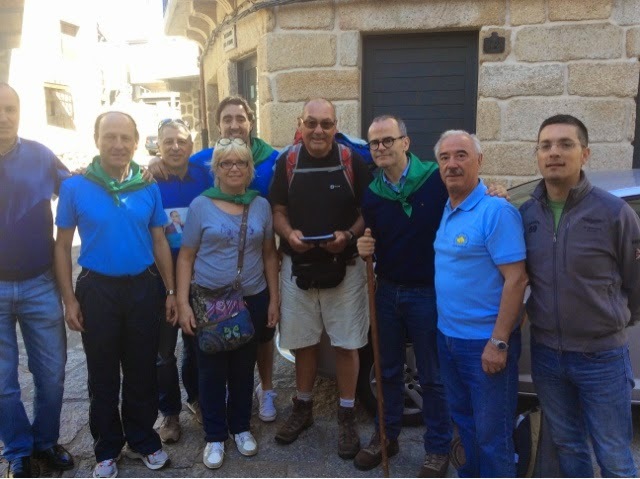 The president of the group presented me with book about the Camino in Galica and more photos were taken. I have to say I have never felt more important in my life, I suspect I was having my five minutes of fame. Eventually I went on my way, somewhat stunned by the genuine warmth and interest shown. What a wonderful surprise that was, and if one day one of you reads this, thank you, you cheered me up no end. A few kilometres later I was in my slightly more expensive than normal hostel with its spacious rooms, hot showers free wifi and general feeling off all round cleanliness. No, this is not an advert, it is just what I found. And all for 15 euro, including breakfast. 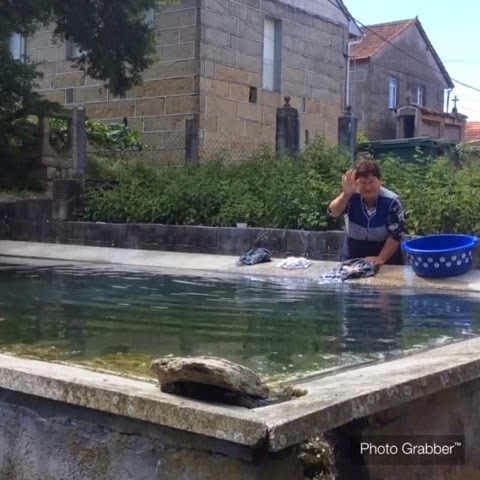 There are public baths in Ourense, if you have a cap and bathing suit. 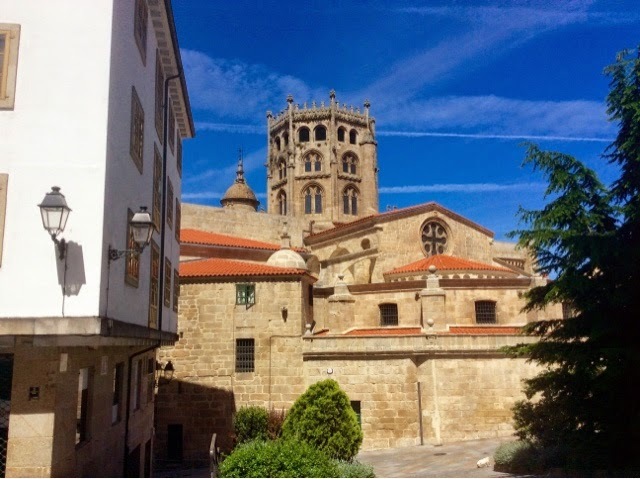 Subean Kings lived here in the 6th and 7th centuries, and it has a Roman bridge and an elegant cathedral. If I sound as if I am quoting from a guide book, I am. 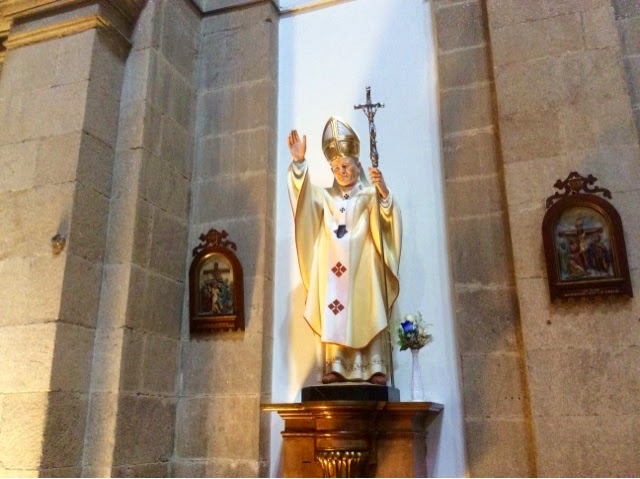 It is a Saturday, I have visited the cathedral with its statue of, Pope John Paul?, walked the cool colonnades and sat in the main square being washed by a hot sun while strolling mums and dads with their new progeny enjoy a day off. I have peered as well as I can into widows high above where flower pots are in full bloom. I have sat in the shade of a park while devouring, somewhat, vouraciously, a very large panini covered in anchovies and olives. 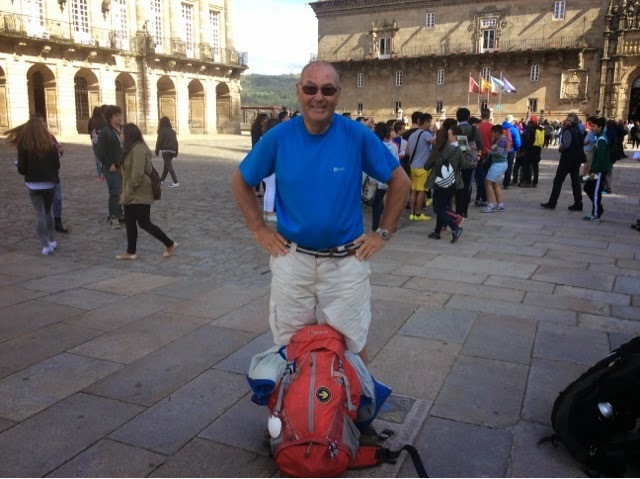 I have found my way out for tomorrow along the appropriately named Way of The Camino, which also happens to be the main pedestrian shopping area and hence busy with those not satisfied that they have their wardrobes filled with exactly the right style, colour or designer label. There is a buzz, people are talking but words or phrases cannot be picked out. It is like the hum of static. Quiet, but constant, never rising or falling but always there. I am going now to find another shady spot, close my eye and sleep. 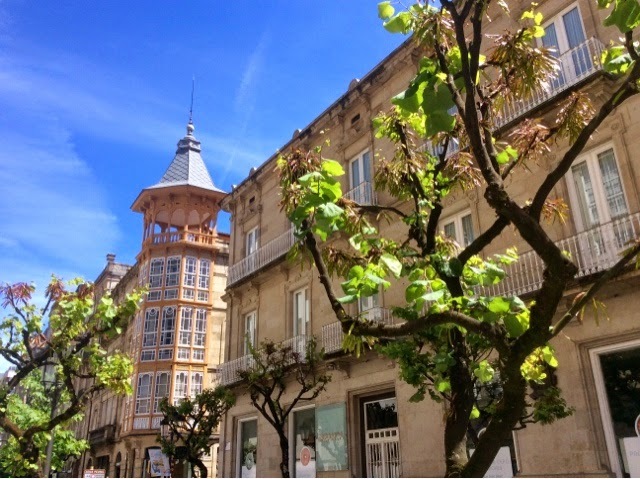 I think the best thing I can do is let you see Ourense through my photographs. I would have liked a single room last night but settled for the hostel as previously mentioned. 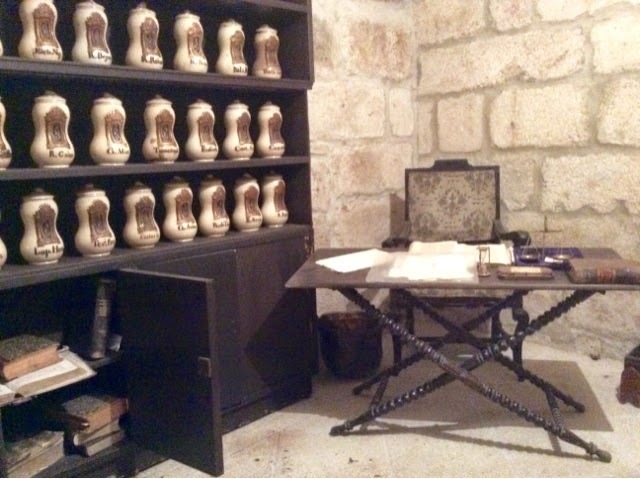 There were three dormitories each with twelve beds in. They were filled in order as and when people arrived. I waited until 6pm and took the decision that no one else would arrive and moved all my gear into room three, and ended up having it to myself. Not being kept awake by others snoring ar paddling off to the toilet at odd hours. I slept through until 8am. 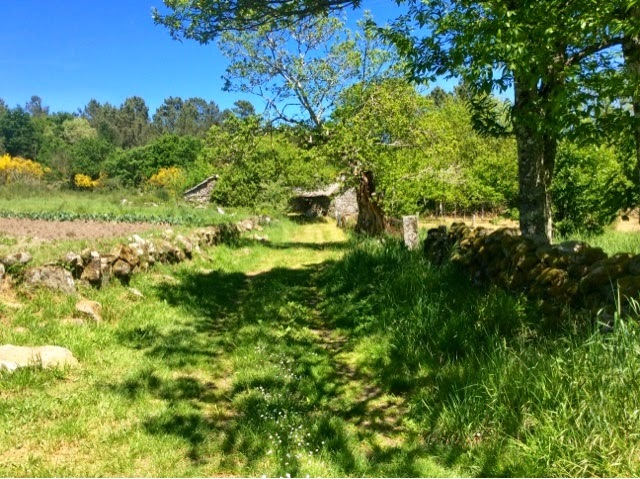 There is a very long hill out of Ourense but once up it I passed through shaded woods, villages of brown granite from which Quartz crystals glinted in the warm sun, and pasture where horses shuffled around on rope that I would dearly have love to cut, smack their backsides and send them off. Dogs fussed and yapped as I passed and only once did I have to chase one back into its domain when it got too big for its boots. Economic problems overtake most of us in time but even so it was sad to see so many buildings with exquisitely cut large granite blocks left to wither along with their grain silos. 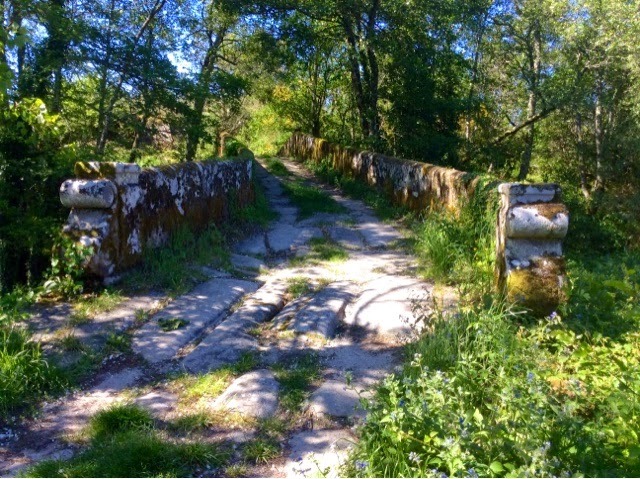 The approach to the village of Faramontoas was over a paved stone bridge that had elaborate scrolls at the ends. What pride the masons must have had in their bridge to decorate it in this way. And what a wonderful sight it must have been when new. 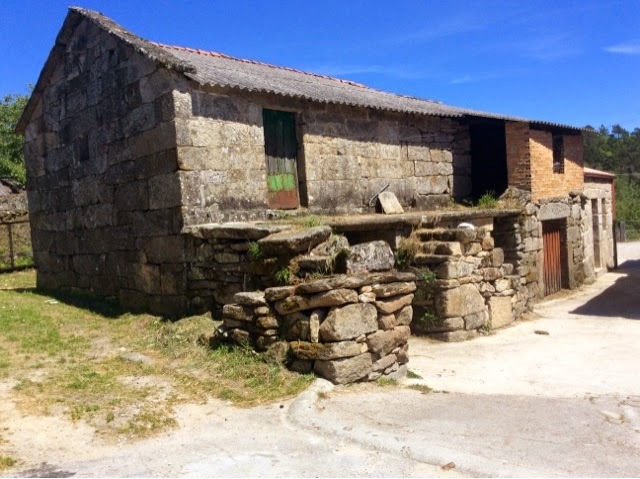 A few metres over the bridge a once mighty granite built farmstead now lay deserted. Yet I could see from its monumental walls and pillars how important it had been. 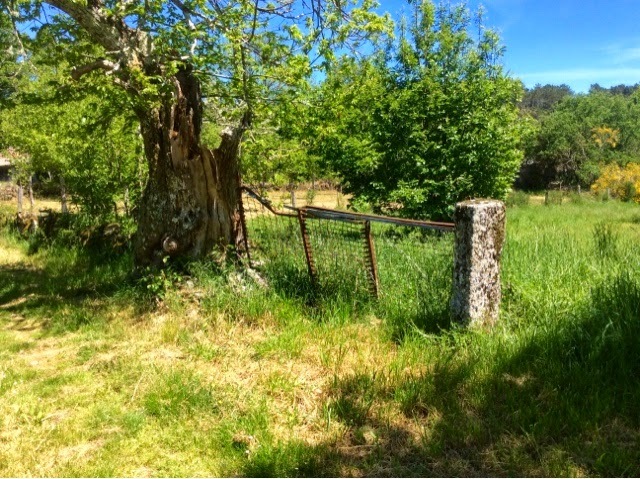 I suspect the fiesta to celebrate the opening of that ancient bridge alongside this estate in this isolated corner of Spain would have been something to behold. 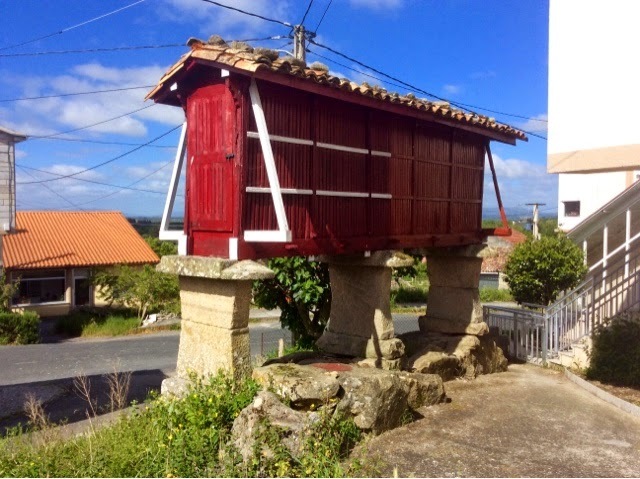 I had intended to stay at Cea but decided a little more in the way of luxury was called for and settled for O Refugio, a small aubergue wedged into a in a cleft in the road in the village of Cotelas. That was a good decision. The room was bijou and spotless, the patrons forceful but kind under a mantle that suggested impatience if they could not make life better for you, and the cooking was so tasty that I did consider staying another night. 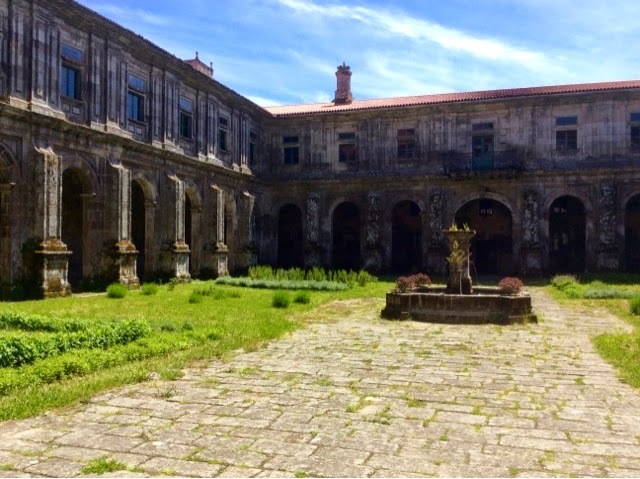 But I wanted to take a diversion to the monastery at Oseira to see if I could stay the night there. Apparently one should phone, but I thought I would take the chance and just turn up. 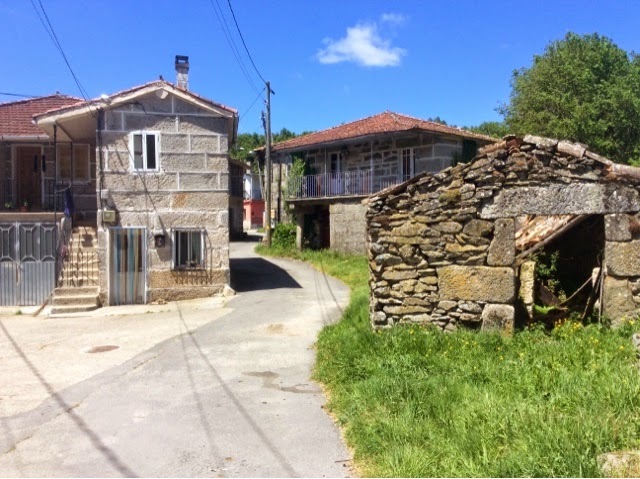 Asturianos to Laza - 164kms to go.